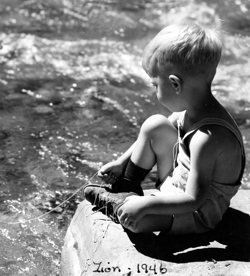 Me, age 3, actually fishing… sort of. The ‘fish’ are still biting and I’m reeling them in, I’m just not posting them. Posting my fishy observations requires so much cleaning up to make them fit for consumption. Finishing the last chapter of my translation of the Tao Te Ching —Tao Te Ching, Word for Word — was the catalyst I needed to reevaluate matters. I’ve wondered for some time why I post my observations in the first place. A Taoist point of view has to be among the most ironic subjects to speak or write on. After all, as chapter 56 says, he who knows does not speak, he who speaks does not know. Naturally, I include think and write along with speak. So I have to ask myself, if I don’t know, why reveal my ignorance? On the other hand, if I do know, why am I speaking? To be fair, chapter 56’s “He who knows…” statement is not the whole story. On the plus side, striving to write coherently is a fascinating challenge, and my observations seem to benefit a few people. You could say I’m composing and performing a form of art… perhaps ‘music’ from, and for, some shadowy part of the mind. Speaking of shadowy, chapter 67 hints, The whole world says that my way is vast and resembles nothing. It is because it is vast that it resembles nothing. If it resembled anything, it would, long before now, have become small. Is redundancy the name of the game? I feel like I’ve said it all before, ad nauseam. Still, the constant echo keep the bio-hoodwink from driving me off course. Retrieving insights from my more balanced moments helps anchor me during my less balanced moments. Alas, forgetting what I truly want of life is all-too-easy! The hitch is remembering my insightful priorities. Redundancy helps. I never remember any old people telling me how fascinating aging would be, although if they had, it probably wouldn’t have registered, seeing as how one can only truly understand what one already knows (see You Know). I seem to be having increasing difficulty remembering things. I know this worries most aging people. However, for me that is a positive thing, as chapter 20 says… My mind is that of a fool – how blank! Vulgar people are clear. I alone am drowsy. Vulgar people are alert. I alone am muddled. Insight seems to flow like water through the void my mind is becoming. Alternatively, perhaps I’m just making lemonade when served with lemons! Then again, I could just be seeing myself more as I actually am rather than as the ‘genius’ I once wanted to believe I was. Yes, that sounds like chapter 71’s Not to know yet to think that one knows will lead to difficulty. Put simply, what I thought was true prevented me from seeing what was actually true — the blinding effect of belief. Another unlikely possibility is that I could be experiencing the beginnings of Alzheimer’s and the hole it produces in memory will lead to the final days of insight before my mind’s curtain falls. Speculating is such fun, especially given how life usually turns out differently from anything we imagine. It is an adventure, that’s for sure! Postscript: It is now 2019, about 8 years after I wrote this post. I now believe I’ve completed the circle, or as chapter 36 puts it, If you would have a thing laid aside, you must first set it up. After my last post, The Tradeoff, I felt I’d said enough. Still, who knows? Oh, and I don’t have Alzheimer’s… yet.